The June/July Issue of American-V magazine. ● Roadtest: 20142 ½ Dyna Low Rider - All my friends know the Low Rider. The Low Rider is a little higher. ● 1977 Low Rider - Panhead Boris’ FXS shows why the original was such a hard act to follow. 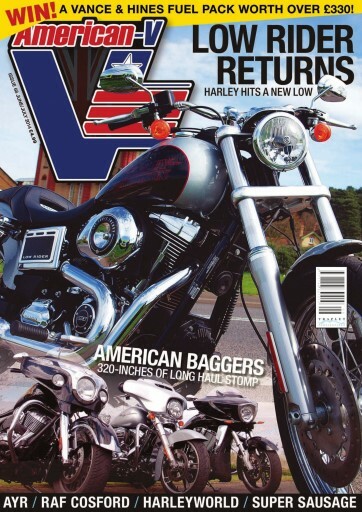 ● Head-to-head: Street baggers - Three American v-twins, very little common technology but everyone a winner in its way: the Rushmore Street Glide, Chieftain and Cross Country go for a grand day out. ● Harleyworld birthday bash - We really need to do more dealer open days. ● Cameron’s Pandian and Scout - One man’s vision of what a modern Indian could have been. ● UK Ironhead meet - Cranking up the cast iron 4-cams for the first of its kind. ● Bat rod - Lord Drake Custom’s take on the blackest of the Rods is as dark as it gets. ● Bike4Life - A grand day out at the RAD Museum, Costford in aid of the Midlands Air Ambulance.